In October I was honored to join seven other delegates on a US-South Africa Agroecology and Food Sovereignty Learning Exchange. As a Black queer and non-binary person who is working to remember and restore my Indigeneity through the work I do in community and at Hilltop Urban Gardens, this trip held both personal and organizational meaning for me. My ancestors were forcibly removed from their homelands. The intergenerational trauma from that displacement and subsequent horrors and enslavement, Jim Crow Laws, sharecropping, and into modern day anti-Blackness, modern day displacement through gentrification and the ongoing fight against white supremacy and white nationalism stay in my consciousness as I work to live my life for liberation and freedom. In 2017 I also committed to find Black joy and healing justice practices. This was my first trip to Africa and off the North American continent, and Hilltop Urban Garden’s first opportunity to connect with other food sovereignty and agroecology farmers internationally. I brought this all with me as I left Seattle-Tacoma International airport with my friend Xolotl Edgar Franks from Community to Community Development. I also brought the intention of coming open and ready to be filled with all that our South African comrades had to share with us. Our first visit was to Sibhale Community Food Project in Soweto. SCFP grows food that is used for meals at the health clinics and shared with some of the families that visit the clinic. We met with the Project Coordinator, Calvin Moloto Makgaila. 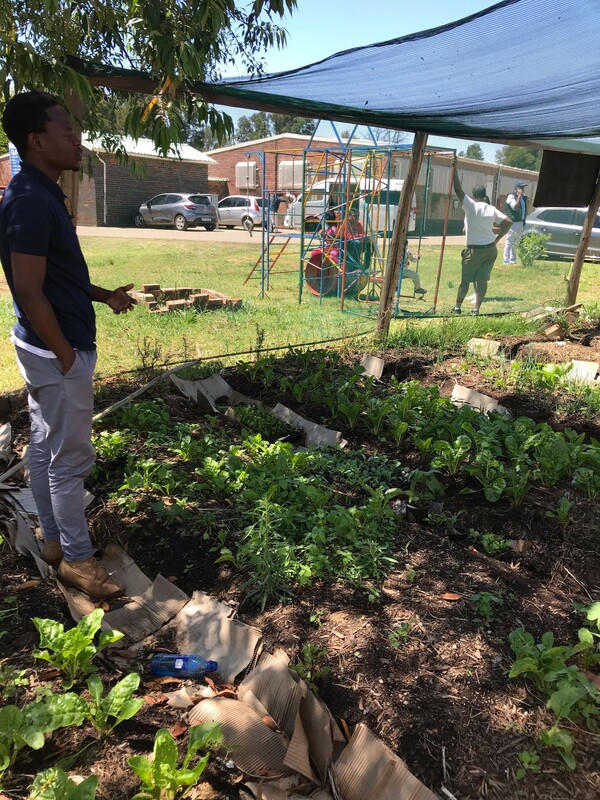 Calvin also helps people grow food at their homes and teaches children about the importance of nutrition. Since HUG does similar work in our community, I felt a special connection to Calvin’s work with SCFP. He’s an awesome agroecologist! We are staying connected through social media and I expect that we will nurture and grow our relationship in the coming years. Hilltop Urban Gardens holds an annual Beloved Community – Food Sovereignty Day of Action in our neighborhood in honor of Dr. Martin Luther King Jr’s vision of radical transformation. This year we will be raising some cash for SCFP. That same day we visited the Greenhouse Project in downtown Johannesburg. One of the things I learned is that after apartheid supposedly legally ended, and Black* people started moving into the cities, there was massive white flight from the city center of Johannesburg. (Sound familiar?) There are now many areas where white folks still own buildings, but have disinvested financially. Because economic apartheid still continues, these largely all Black areas are in a great struggle. (Sound familiar?) Forty percent of the country is unemployed. I also learned that much like the United States, the best land was given to white settlers and Indigenous communities were forcibly removed to the poorest lands in the country. I don’t claim that in 11 days I understand much. I got brief snapshots. My goal is to share what I learned and witnessed and, in some cases, give my analysis. I was surprised at the many similarities between post-civil rights era US and post-apartheid era South Africa. There’s much more to learn, process, and share. *I’m using Black like we do in the US. It includes Black/African and Colored people which are the racial designations in South Africa. Posted in Agra Watch Blog Posts, Food Justice Blog Posts, Projects, Slider.